When it was determined that Jesus was indeed dead, Joseph of Arimathea went to Pilate for permission to take care of His body. He had prepared ahead of time for his own burial, and decided to use his own tomb for Jesus. I can only imagine with what care and sorrow the body was removed from the cross. The normal procedure then would have been to clean the body, washing away the blood and flesh that had been torn in the scourging. His body was likely anointed with preserving oils before it was wrapped in the clean linen that had been provided. What a somber procession as His body was carried to the tomb. Again, using my imagination, it seems to me this procession would have been made in complete silence. The crowds had dispersed by then; the show was over. Night was falling, and as the people left for their homes and their own meals and beds, Jesus was taken to the tomb where His body would lie. . . . . .for a little while. Just for a little while. Have you ever wondered what this Gentile centurion must have felt, realizing what he had just taken part in, what had just been finished? I’ve wondered what he must have thought and felt just three days later when he heard the news that Jesus had risen from death. I have a pretty good idea that he went looking for Jesus, rejoicing when he found Him; I believe we’ll see that centurion in heaven. What about the others who were there? What a solemn moment for all of them. The earthquake, the rending of the Temple veil (which of course they did not see, but were sure to hear of), and the opening of the graves. I don’t think it’s possible for us to understand the drama, the fear, the consternation. And what about the women? Who exactly were they, and how could they stand to watch what had been done to Him? First, I want to say that these women showed more courage and dedication to Jesus than the men who had sworn to die with Him had shown. They were there, not hiding somewhere in the crowd, quaking in their sandals for fear of being arrested themselves! Mary of Magdala, or Mary Magdalene: Jesus had cast seven devils out of her. She was totally dedicated to Him. Mary the mother of James and Joses: We know only that she was the mother of James, whom Jesus chose as a disciple. She was also at the tomb when it was discovered that Jesus had risen. Mary, the mother of Zebedee’s children: This Mary was the mother of James and John, the “Sons of Thunder” who followed Jesus during His earthly ministry. From the Gospel of John, we know that Jesus’ mother, Mary, was also there at the crucifixion, as well as John himself; he also mentions othersof Jesus’ disciples who stood “afar off.” Crucifixions were always well-attended, and there was surely a huge crowd present at this one. The dedication of the women who were there is noted because of their courage, their love for Jesus, their apparent lack of concern for their own safety. They loved Him; they had ministered to Him out of their own funds whenever they could, provided shelter and food for Him and His disciples. I can only think that they must have thought their world was coming to a horrible and heartbreaking end. What is the biggest parenting mistake you made? Tell about a time you “hit the mark” in parenting. This is a hard one for me, and somewhat painful. We all evolve over time in how we respond to people. Our attitudes change. They grow either harder or softer. Mine have softened considerably. What that means in terms of childrearing is that I was too quick off the mark, especially with my first two. I was reared by an authoritarian father. His word was law, and you challenged him at your own risk. He was typical of his generation. That wasn’t always a bad thing. I grew up watching Father Knows Best, and it was a great program. We could use more of that today, couldn’t we? Instead, we have programs that portray Dad as Dumb, Dumber, and Dumbest. Mom is the wise one, and the kids are all full of perfect one-liners that put both parents firmly in their places. I hate those shows, and I won’t watch them. Give me Andy Griffith any time! Anyway. Add to my authoritarian father my natural temperament to take charge, lead, problem-solve. Whoever first said “my way or the highway” was like me. Also add into that mix the strong belief in the church we attended when our kids were young that every home should have a well-used paddle. We did. I am not against spanking, and I don’t believe we ever took it to the level of abuse. Three quick swats was the usual discipline, over and done pretty quickly. So I would still apply that board of education to the seat of learning, but it would be far less frequently. It would be reserved for outright, rebellious disobedience. I would be more creative in dealing with smaller infractions. I’d like to believe I would be a better listener. I had very good radar with my kids, and I didn’t miss much. I did, however, miss some things that cause me deep regret now. No parent can be there 24/7. No parent can know every interaction between the children, and no parent is god-like. And contrary to what we’d like to believe, all children lie. All children push the boundaries. All children hide things from their parents. I did. Why wouldn’t mine do the same? So, wrapping it up, I would paddle less often, and listen more closely. Where did we hit the mark? Sometimes I feel there was very little we did right, but the thing I hear from all four of my kids is that we taught them to think for themselves. 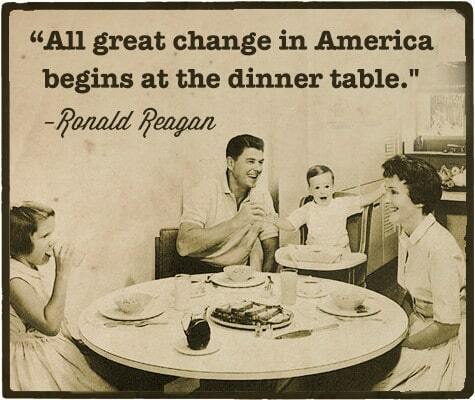 We had lots of family discussions at the supper table, something which I fear is becoming a part of the American past. We talked about faith, politics, history, relationships, dating, just about everything. It was good. We spoke, they listened. They spoke, we listened. They have all told us that they are thankful for our teaching them to think criticially, not to be duped by every silly fad or fantasy; to be able to defend what they believe because they believe it, not because someone else believes it. And they’re all raising good kids. That is a great joy to me. Strong to the very end, that was my Jesus! His life was not taken from Him; He gave it up when all the work was done, all the prophecies had been fulfilled. No one could have taken His life from Him against His will. Some amazing things happened when Jesus gave up His life. First, the veil in the temple that separated the Holy of Holies from the rest of the temple was torn in two pieces, from the top to the bottom. Second, there was an earthquake in which the rocks themselves were split. Third, tombs were opened and many bodies of the saints arose. After His resurrection, they went into the city and were seen by many people. The veil. It was not rent by the earthquake, but by the hand of God. It was done from above. It must have happened just about the time when the priests entered the holy part at the evening sacrifice. What a thing to see! As the earth rocked and shook, the veil, which is thought to have been about the thickness of a human palm, was torn in two pieces from the top down! The most holy place was opened now, showing that the sacrifice of Jesus had eliminated the need for any more blood to be shed to cover sin. Acts 6:7 tells us that many priests became converts to the New Way. It is no wonder! The earthquake.Only in Matthew is this event recorded, because the death of the King shook the very earth itself and split the rocks. Only in Matthew is Jesus presented as the King, Messiah, Creator and Ruler of all the earth. The tombs. The open graves declared the most wonderful news ever: His death had broken the power of death forever. Through His death He destroyed Satan, he who had the power of death (Hebrews 2:14). It wasn’t until after His resurrection that the bodies of the saints left the tombs and entered the city, to be seen by many. He had to rise from His own grave, defeating sin and death, before those who had already died could leave their graves and be seen in the city. Everything was done in its proper time. Every single event, from the Last Supper to Jesus surrendering His spirit of His own volition, was done according to scripture, including the resurrection of Jesus and then of those saints who left their graves, showing the power of His death and resurrection. What happened to them? We don’t know. We’ll know someday. What we do know is that their appearance must have amazed all those who saw them, and convinced the people that Jesus had indeed risen from the tomb. It was an amazing proof of the efficacy of His death and resurrection. That is all we need to know. We don’t know for sure who the men were who thought Jesus was calling for the prophet Elijah (Elias) but it was most likely some of the Jews who were there mocking Him during His ordeal. When someone gave Him vinegar on a sponge, others said to leave Him alone and see if Elijah would come to save Him. There is a more detailed account in John’s gospel about the vinegar-filled sponge. Once all the things He had come to do were accomplished, and so that scripture might be fulfilled, said “I thirst.” To acknowledge the unbearable thirst was the last small thing to be fulfilled (Psalm 69:21), and now He could go ahead and take the brew that had been intended to give Him some small measure of relief from the agony He endured. From noon until three, the entire land was covered in darkness. I would love to know why that supernatural darkness covered the land. Was it to protect Jesus from the insolent eyes of the watchers? Was it to strike fear into the hearts of those who mocked Him? History records no eclipse of the sun. Calendars tell us that the moon was full. It is only when the moon is new that there can be a full solar eclipse. This, I believe, is the moment He dreaded the most as he struggled in prayer in Gethsemane. Jesus had become sin for us. He knew no sin, yet He had actually become sin. As the ugly weight of that settled on Him, the holy, holy, holy Lord God of Hosts could not look on His beloved Son. He had to turn His face away, and at that moment Jesus’ suffering was more intense than any of us can even begin to understand. It is only when we understand the blackness of Jesus burden when He was forsaken by the Father that we can understand the symbolism of the black darkness that settled over the land. At that moment, Jesus was alone. Truly, completely, deeply alone. There was nothing to ease His suffering, nothing to deaden the pain. His power did not protect Him from the full weight of sin; it did make Him able to bear that which weighed on His soul, the feeling of the horror of sin. And He cried out in despair, knowing that the Father could not spare Him, could not protect Him, could not even look at Him. He WAS sin. Do we ever, ever, think about the worst of Jesus’ suffering on that day? We know His physical pain was immense, but do we think about what it was for the sinless Son of God to become sin? To become the black, black curse of death and torment, to drink the cup of the poison of sin to the bitter end? I will tell you this: Studying these passages, preparing to write, and then doing the actual writing has created in my heart a sorrow greater than I have ever felt before; it has also created a gratitude and a sense of peace and joy beyond what I have ever before understood. Crucifixion was not a neat and tidy experience. Very few paintings depict the reality. Isaiah 53 tells us that “there was no form nor comeliness” left to the face and body of Jesus by the time He was on the cross. One could hardly tell that He was a man, He had been so severely scourged, His face and body destroyed by the brutality of the treatment He’d received at the hands of the Jews and the Romans. 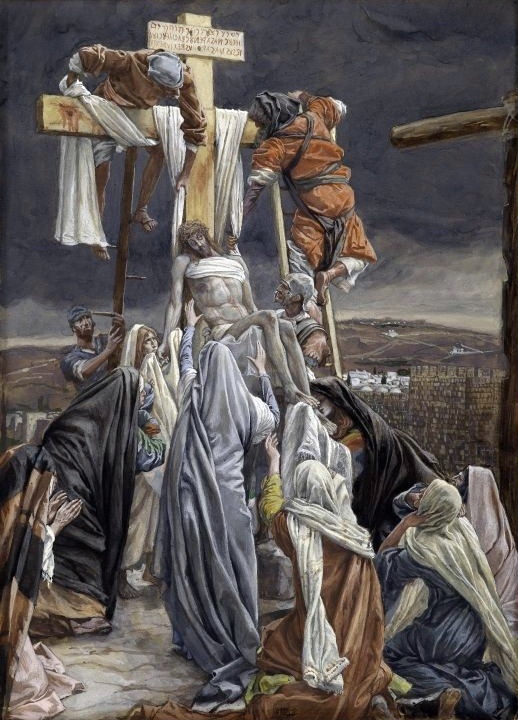 This painting, however, is realistic in the proximity of the people to those who suffered on their crosses. We know there were at least two who were crucified with Him, but there could have been more. 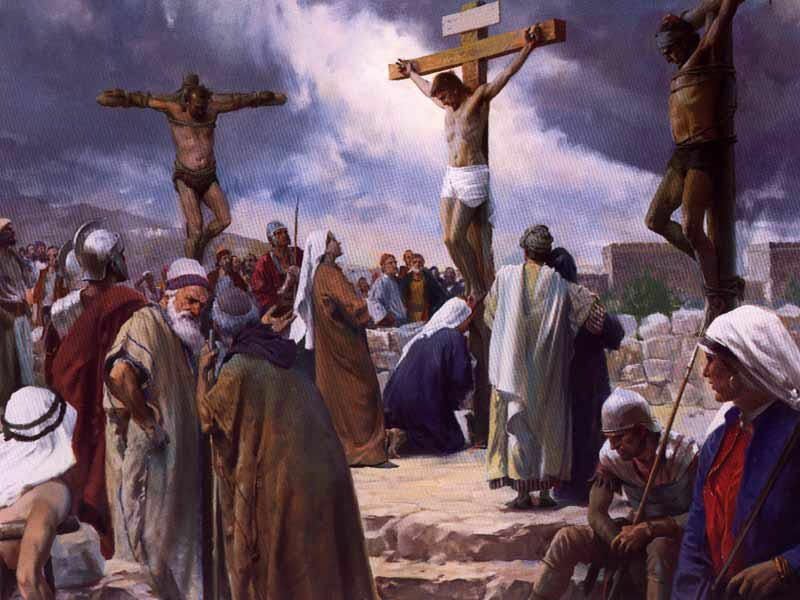 It was common practice for Rome to make crucifixion as big a spectacle as possible, hoping to terrorize people into accepting Roman rule without a struggle. There were probably a lot of people who passed by the grisly scene. Some were just looky-loos, people who had nothing better to do and were curious what all the fuss was about. Others were there out of duty: The team of Roman soldiers whose task it had been to nail Him to the cross, and then raise the cross and drop it into the prepared hole. That process, by the was, was horribly painful for Jesus. 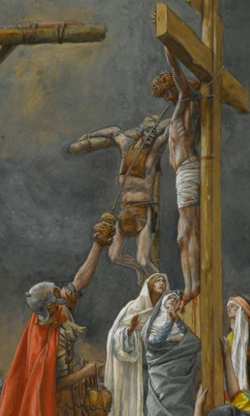 His lacerated back rubbed against the rough wood, and His joints were pulled out of place by the weight of His body as the cross thudded into place. Women, have you ever thought about that? Mary stood and watched as her Son suffered through the last several hours of His life on earth. She stood near enough to the cross to hear His voice; to see his awful wounds, to know how much He suffered. I wonder if she didn’t just sink to the ground at some point, dying inside for the suffering of her Son. The tears must have poured from her eyes in a steady stream as she watched Him there. I have three sons and a daughter of my own. To watch any one of them endure such hideous, unjust suffering would just about kill me. I think I would be wanting to die myself. I’ve often wondered how Mary could stand, it, being there, hearing, seeing, feeling the great pain and suffering that her Son was enduring. Hearing the wicked mockery of those who stood by, and even the mockery of the others who were crucified with Him. What was she thinking? Did she understand that this was what He came to do? Did she know He would rise again? And someone else was there, someone who was probably invisible to all but Jesus Himself. Satan was there, gloating, laughing, doing a victory dance. Finally, finally! The Son of God was suffering, and He would soon die. But Satan’s victory dance was short-lived, as I believe he knew it would be. He had worked hard to keep Jesus from the cross, trying to take His life before He could accomplish the prophecies and fulfill the will of the Father. Even though it seemed Satan was winning, he was losing. He had bitten Jesus’ heel, but Jesus was crushing his ugly head.